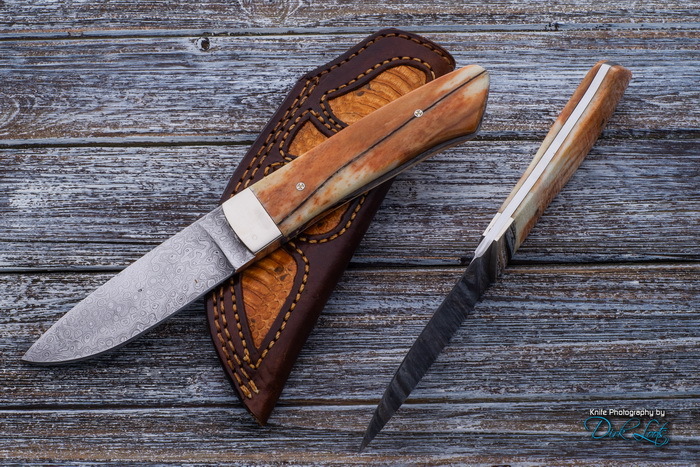 **** Chosen by Winner: Chris C.
Tim Britton has crafted a full-tang raindrop pattern Damascus (L6 and 1084) sheath knife with a 3.75-inch drop point blade, 8.25 inches overall length. The handle scales are stabilized Giraffe shin bone with mosaic pins. A Leather sheath with lizard inlay by Kenny Rowe is included. I have been making knives very seriously since 1971. My work has been featured in all major cutlery publications and is displayed at 5-8 shows per year. BRITTON knives are in use throughout the world…most notably as part of the issue to the palace guard detachment in Ivory Coast, Africa. I have virtually all of the “supersteels” in my shop and access to others for your special needs. All handle materials, from lapis lazuli to Fiji fire pearl to the most common canvas micarta is handpicked by me from suppliers at shows or in their shops. You are assured of the finest steel, hand-picked premium handle materials and my unconditional money back guarantee in the event that you are not completely satisfied with your BRITTON knife.